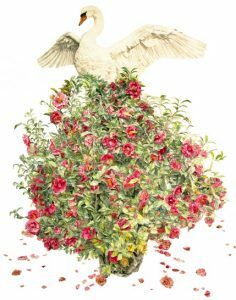 Steven Barker’s Camellia and Swan (44″x62″) will be one of the pieces featured in the exhibit. Barker is an artist living and creating in Mount Pleasant. NTCC alumni from 1997, he went on to Texas A&M University-Commerce for his BFA in 2000 and continued to Johnson State College in Vermont for his MFA in 2004. His drawings and watercolors make use of high detail rendering of regional subjects from nature as subtle allegories of aspects of life. Isolating them on the white of the paper, he says, removes location, time, and context, allowing the viewer to bring their own field of reference when interacting with the image. The right metaphor tells its own story.